For families with young children, living on a cul de sac is great because it provide a safe place for the children to play. Perhaps that’s why the families I work with love Heather Knoll Cluster in North Reston. Designed by Berry & Co., Heather Knoll Cluster was built in the early 1990s. It is a small community of 52 townhouses distributed among 13 buildings. Each home has a traditional brick front with fine detailing, classic cedar siding and elegant trim. The homes come in three different styles, with variations in room sizes and overall square footage. They are all two levels with a basement, three bedrooms, and two and half bath. They also each have a one-car garage — a bonus for Reston townhomes — and privacy fences separating the yards. And they have fireplaces! Heather Knoll Cluster is located on Woodbrook Court off of Woodbrook Lane and Wiehle Avenue in the North Point area of Reston. 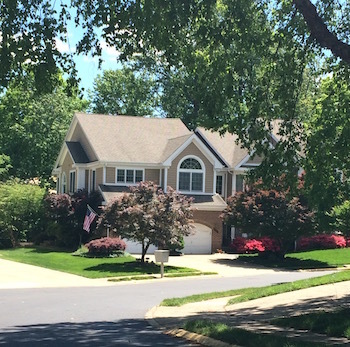 The neighborhood is close to the Fairfax County Parkway and Route 7. The surrounding area has wonderful walking paths and plenty of trees and nature. North Hills pool and tennis courts are about a five-minute walk, and North Point Village a 10 to 15 minute walk (depending on how fast you walk).